A light, layer-able hairspray for styling and finishing. One light mist all-over gives you light hold -- perfect for daytime. A second layer all-over gives you strong hold and support -- a go-to for events and evening looks. 1. Create your desired hairstyle. 2. Apply a thin veil for light hold. 3. Apply a second veil for stronger hold. Tip: This is a brushable, layerable hairspray, so don't be afraid of it! How much hold it has is up to you! Ingredients: Alcohol Denat., Hydrofluorocarbon 152A, Octylacrylamide/Acrylates/Butylaminoethyl Methacrylate Copolymer, Aminomethyl Propanol, Panthenol, Hypnea Musciformis Extract, Sargassum Filipendula Extract, Salvia Hispanica Seed Oil, Litchi Chinensis Pericarp Extract, Gelidiella Acerosa Extract, Algin, Carrageenan, Coco-Glucoside, Hydrolyzed Keratin, Chitosan, Sorbitol, Acetyl Triethyl Citrate, PEG/PPG-17/18 Dimethicone, Caprylic/Capric Triglyceride, Cetearamidoethyldiethonium Succinoyl Hydrolyzed Pea Protein, Xanthan Gum, Glycerin, Triethylene Glycol, Benzyl Alcohol, Propylene Glycol, Fragrance. This hairspray works really well on my fine hair. It doesn't feel sticky and holds my hair in place all day. I know some other reviewers have mentioned they don't like the scent, but I actually like it. 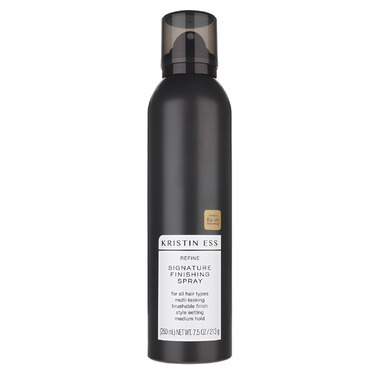 I haven't used any other hairspray, or shampoo, since I discovered Kristen Ess a year ago! This spray works exceptionally well, however, I'm confused over the scent that this company uses. It's SO strong and lasting, and it's not a pleasing smell. Tone is down on the scent and it would be worth the 5 stars. I have very thin/fine hair, and this hairspray does do a pretty good job of holding my hair style all day, which is hard for me to find. However, my only issue with it is that I find it very sticky and the next day my hair feels gross. With other hairsprays, I am able to extend my hairstyle to the next day but I find myself having to wash my hair after having this in all day. This hair spray is great. It smells good and gives nice hold. LOVE. I am not a fan of hairspray in general but after having a baby I lost some hair around my hair line and now it's growing back and it's all these little baby hairs that stick up when I put my hair up. This spray holds them down without being too crunchy or alcohol smelling. I love it. I don't have to use 40 bobby pins trying to tame the baby hairs anymore. Like it--it has great hold!! Light floral scent, not overpowering. Holds hair nicely in place or apply a lighter application for control with movement. Will definitely buy again.